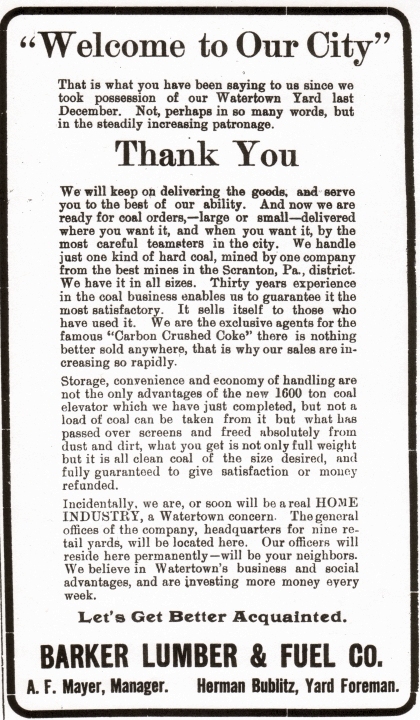 [advertisement] To serve you better than ever before, we have our coal elevator about completed, and we are now handling all of our hard coal through it, and if you buy your coal from us you are assured of perfectly clean coal, as all of the coal coming out of the elevator must run over a screen before it can be loaded into the wagon, and then don't forget our positive guarantee of satisfaction goes with every load — you take no chances whatever with us. We are getting in a big stock of building material for spring business and we can supply you with anything you want; to deal with us means saving of money on every purchase as our motto is "good goods at right prices all the time." Barker Lumber & Fuel Co.
04 06 Come and see our large new coal elevator. Where you don't have to shovel any coal. Where all the coal is screened perfectly clean when it is loaded into your wagon. Where you don't have to wait to be loaded. Where we load a ton in a minute. Where all the coal is guaranteed to give satisfaction or money refunded. We also have a good supply of very choice maple flooring clippings, and hard wood factory clippings, either of which are elegant fuel for the kitchen stove; better try a load. "The Home of Quality and Satisfaction"
That is what you have been saying to us since we took possession of our Watertown Yard last December. Not, perhaps in so many words, but in the steadily increasing patronage. We will keep on delivering the goods, and serve you to the best of our ability. And now we are ready for coal orders — large or small —delivered where you want it, and when you want it, by the most careful teamsters in the city. We handle just one kind of hard coal, mined by one company from the best mines in the Scranton, Pa., district. We have it in all sizes. Thirty years experience in the coal business enables us to guarantee it the most satisfactory. It sells itself to those who have used it. We are the exclusive agents for the famous "Carbon Crushed Coke” there is nothing better sold anywhere, that is why our sales are increasing so rapidly. Storage, convenience and economy of handling are not the only advantages of the new 1600 ton coal elevator which we have just completed, but not a load of coal can be taken from it but what has passed over screens and freed absolutely from dust and dirt, what you get is not only full weight but it is all clean coal of the size desired, and fully guaranteed to give satisfaction or money refunded. Incidentally, we are, or soon will be a real HOME INDUSTRY, a Watertown concern. The general offices of the company, headquarters for nine retail yards, will be located here. Our officers will reside here permanently — will be your neighbors. We believe in Watertown's business and social advantages, and are investing more money every week. A. F. Mayer, Manager. Herman Bublitz, Yard Foreman. At 3:40 o'clock Tuesday morning [June 29th] the fire alarm whistle called the Fire Department to the Barker Lumber Co., elevator, coal and lumber yard in First Street, and immediately the department sent in a second alarm of fire by having the fire bell rung, and people all over the city were attracted to the fire as they arose from their beds and saw the terrific blaze. 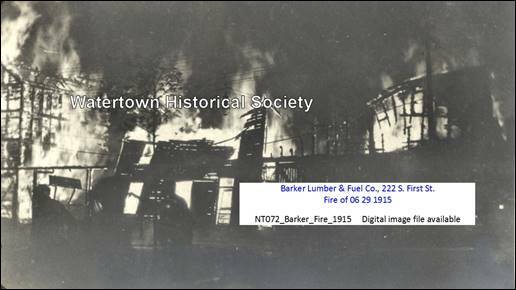 The fire boys were on hand promptly, and they fully realized what a hard task was before them, for the entire plant was ablaze and the wonder is that the adjoining property was not also totally destroyed, as was the elevator, and lumber sheds of the Barker Co. The city water pressure was at its very best, and the boys at the water plant kept the pressure up to its fullest capacity throughout the entire time of fighting the fire, which with the excellent work of the fire boys deserves the highest praise and commendation of our people — every fireman from the chief down did heroic work. The tobacco warehouse to the south of the fire was saved from destruction and much other surrounding property. Deiter & Ullrich of the New Method laundry, sustained considerable of a loss. The roof over the rear half of the building was burned away and the boiler and machinery beneath were badly damaged by water and fire. The proprietors of the laundry were fortunate in having their loss partially covered by insurance. Deiter & Ullrich will take care of their laundry business just as if nothing happened. In fact the wagons were out next morning making the usual collections. The origin of the fire is somewhat of mystery. There appears to be a belief, however, that it was of incendiary origin. The first general alarm was turned in by Patrolman Arthur Doerr at 3:40 o'clock Tuesday morning. Mr. Doerr was making his usual rounds and was at a point near the fountain on the west side when he observer a bright reflection and at first was a little bewildered as to the exact location of the fire. Hastening to the Main Street bridge, he observed the rear of the lumber and coal sheds one mass of flames and no time was lost in turning in the alarm, a second alarm having been turned in a short time after. One hour before the fire, Patrolman Lucius Bruegger passed the office and lumber and coal sheds on First Street and at that hour as far as he could observe, conditions about the premises were normal. Several have stated that when they first observed the fire, they detected the smell of burning kerosene oil. The fact, together with the rapidity with which the flames spread, strengthens the belief in the minds of many that the fire was of an incendiary origin, the smell of oil is said to have been detected by west side people. It was a fierce fire and it is lucky that the loss was not greater. The fact that the laundry building was not completely destroyed, is due to the fact that when the Barker Company built four years ago they lined the north side of their building with asbestos as a protection against fire from the north, a fact that proved a blessing to the owners of the laundry building. Several buildings adjoining caught fire and it was with much difficulty that they were saved. The Jas. D. Casey building across the river [119 Water] caught fire. 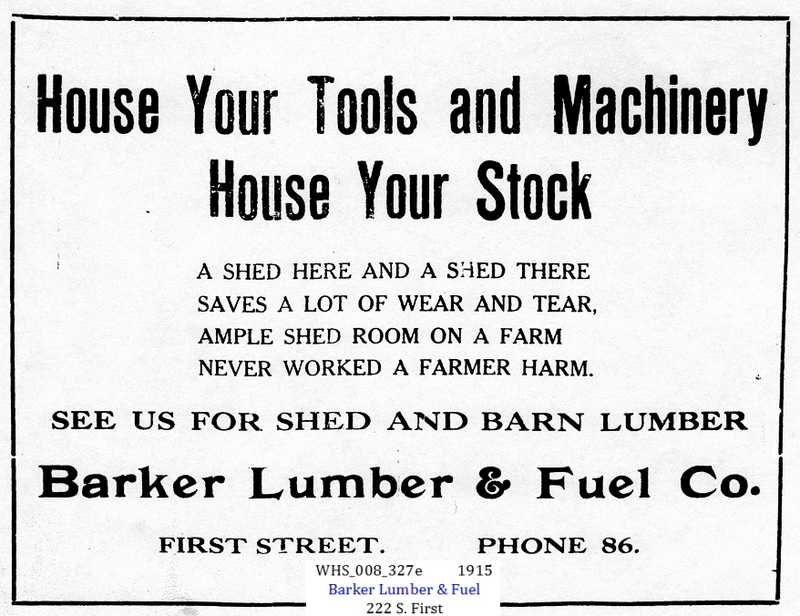 The Barker Lumber and Fuel Company carried an insurance of eighty per cent. Their loss consisted of retail office, lumber and coal sheds, 900 to 1,000 tons of hard coal, 75,000 to 100,000 feet of lumber, three cars of 600 barrels of cement, together with a large quantity of sash, doors and molding. The Barkers take their loss philosophically and are not discouraged by heavy loss. They announced that just as soon as adjustments can be made with the insurance companies, they will begin rebuilding, and better than ever and will include a fireproof elevator. The Barker Co. estimates their loss at $30,000 and Dieter and Ullrich say they cannot make a fair estimate of their loss just yet.